kapunda garden: June 5th, 1885. "People are prophising a dry season. We have only had light rains, and things will prove most disarstrous in the extreme. The farmers cant see the folly of carrying all their eggs in one basket, for they depend solely on wheat. I don't know, though, what else will grow in this arid climate." William Stagg, June 5th, 1885. As a teenager, he lived with his parents near Tarcowie in South Australia. The house was typical of the time. William and his father cleared the land and grew crops, with uneven success. In the news lately here, an El Nino year is predicted and rainfall is predicted to be low, and so far 2012 seems to be much the same. In the words of William Stagg (aged 17) "people are prophising a dry season." I often refer back to the copy I have of Nancy Robinson's book that was published in 1973 and which I bought in Salisbury, SA, for one dollar. 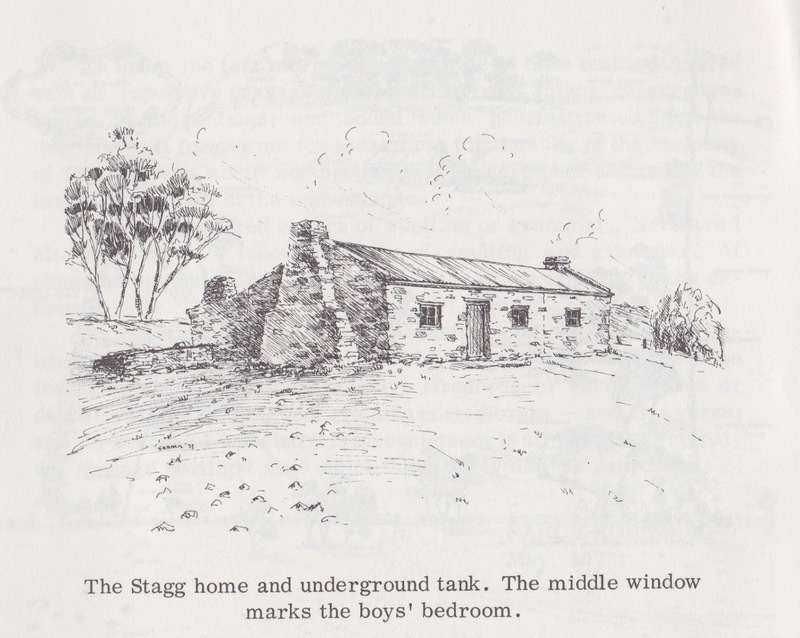 The book is titled "Stagg of Tarcowie: The Diaries of a Colonial Teenager 1885-1887" and is good reading if you're having a hard time growing food in your garden. Descriptions of ploughing with a single furrow plough and a horse, grubbing mallee stumps and picking stones place my garden difficulties back into perspective. His view of monoculture, and of farmers "carrying all their eggs in one basket" is interesting too. "I am eighteen years old today. I aint very big for my age - have not a sign of whiskers or mustache so I'm a boy still. We were ploughing and when it came to a steady rain about twelve o'clock, I thought I was going to have a half holiday. In this respect I was disappointed as Old Charlie needed four shoes and so I was sent off with him to the blacksmith. I bought a pound of dates for ninepence, the seeds of which I am going to plant." William Stagg must have liked growing food plants, and all of those date palms that grow around old houses in rural South Australia must have had similar origins, and they are often the only remaining indication of habitation until one gets close and finds the old stones and roofing materials that have fallen, unattended, to the ground. This picture is not a homestead. This is a painting that I made some time ago before the Reformatory (a part of Kapunda's heritage and associated with Mary McKillop) was demolished. The palm tree is still there and this photograph is taken from almost the same angle. I wonder who ate the fruit that grew this tree.